With thanks to DJ for the idea, our next character creation contest tips the hat to Ron Howard's new film "Angels and Demons". And to honor the author of the original novel, Dan Brown, if you write a story to go along with your image you must make it as full of turgid prose and idiotic plotting as possible. Sorry, sometimes that English degree can't be restrained. Your entry must in some way be related to angels or demons, but don't think that means only the big feathery winged dudes or giant red monsters with horns and bat-limbs. Be creative, and above all, make a cool looking character. That's pretty much it! The winner will get to choose either one item to be included in HeroMachine 3, or they can have a caricature of their face added to the program for all eternity. idiotic plotting… well after the third world war earth became a nuclear wasteland where life was no longer possible. modern society was destroyed and a new era arose: the brutal age of space piracy. WOOT! You picked my theme! This is my first entry. He is a demon who surrendered to god. 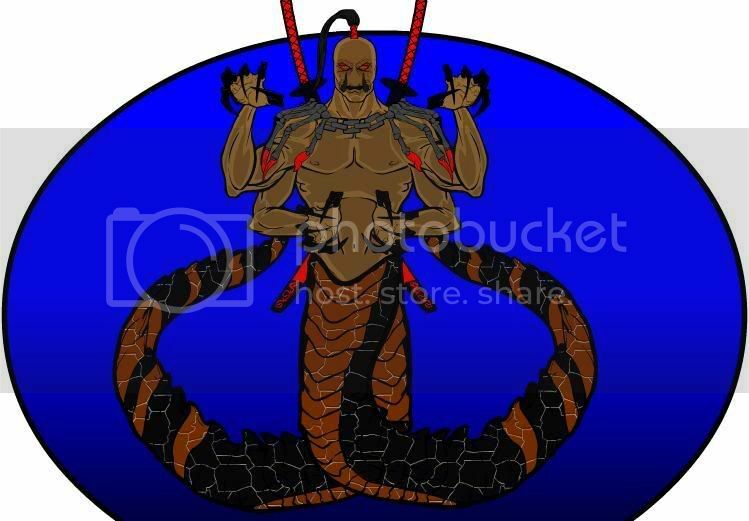 The shackles are worn as a reminder of his past life. 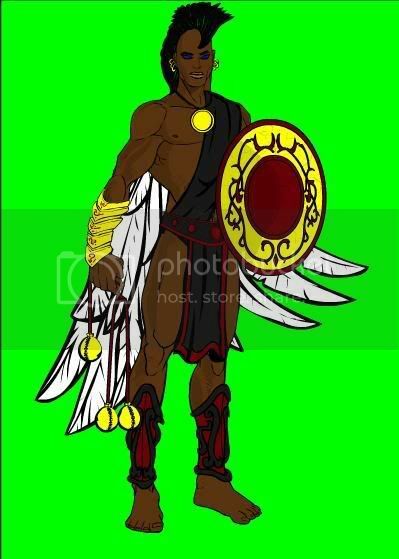 He is a warrior angel who is known for being a bit to brutal. 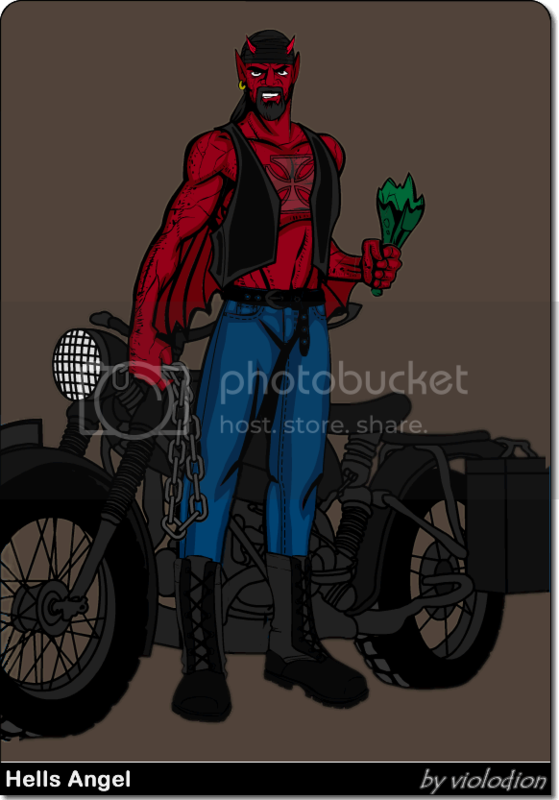 Heres my first entry: Son of the Devil, Demonan! hopes i did better this time http://s727.photobucket.com/albums/ww278/RJ_McD/?action=view&current=undeadrider.jpg you said they didn’t have to be the christian ideas of a demon or angel right? Oh. Is it only for HM3 or can we use other HM’s? No offense Jeff, but after much personal deliberation I feel that I cannot enter this contest. There seems to me to be a certain sacrilegious quality. I feel uncomfortable with the idea of us trying to “top” one another to make the “coolest” angel or demon we can think of. I will be eagerly awaiting next Tuesday to find out what the next contest is, but I can’t participate this week. Again, I hope there’s no offense. Thanks Hammerknight for the reminders — post updated with new rules. Any HM version is fine, but no Photoshopping. I’m sorry to hear that, Damien, and I hope I didn’t cause offense with the topic of the contest. Unusual viewpoint as places of worship the world over through the millennium are filled with iconography of the divine from the hands & minds of the laity. 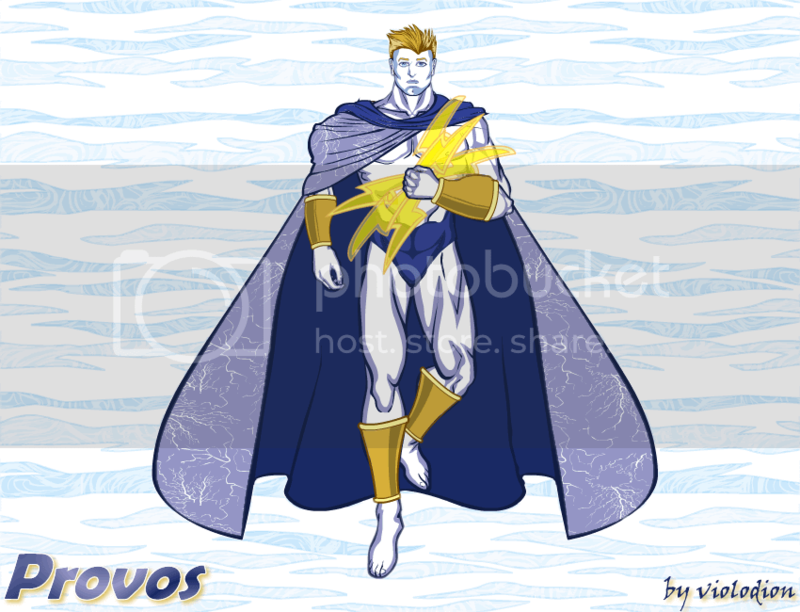 Do feel free to populate your UGO Hero Archive thread with other things you’ve created. The story is optional right? Yep, stories are always optional. @ Jeff: No, I don’t hold offense against things like that. I’m horribly prejudiced against intolerant bigots. @ Violodion: My viewpoint on this is based on the fact that none of those religions held a contest to see who could invent the raddest angel or gnarliest demon. But it’s still a personal belief and not one I expect you all to convert to. As for my other creations, just click on my name above. My site would appreciate the traffic lol. First time I’ve entered one of these contests. To be honest, this one creeped me out after I was done. And after I made this one I kinda giggled. It will not save a whole wingspan. Hope you guys like it. I am quite proud of this one. 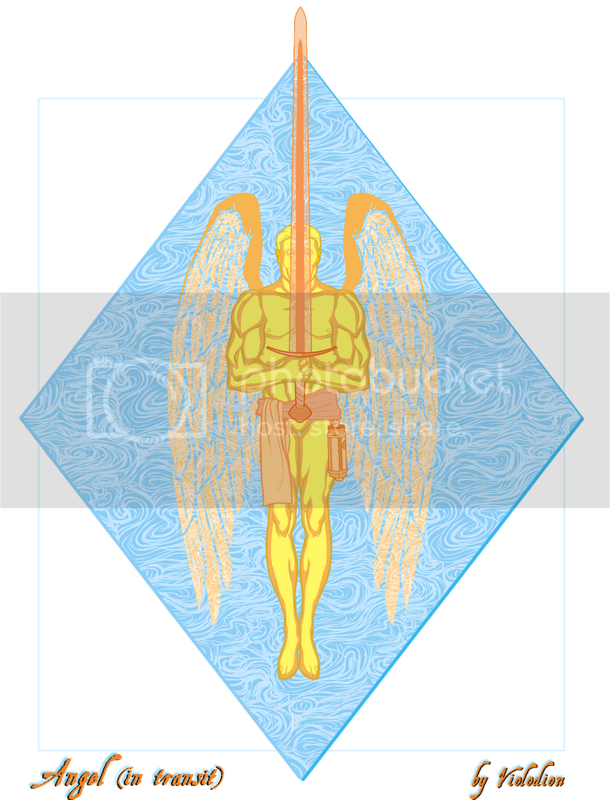 He is the holy Seraphim, the ultimate symbol of hope and goodness; eternally opposed by all diabolical. The Great sent him to earth to spread happiness and uphold justice; and at every turn, The Dark sends his minions to foul things up. Of all of Dark’s legions, Dezmonan is the most eager to antagonize Seraphim – especially if it involves a twisted mockery of some good deed. 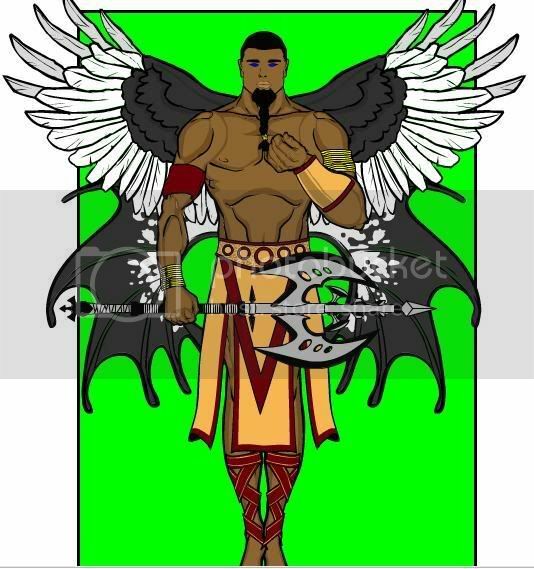 Seraphim won’t stand this injustice for long… With The Great’s permission, Dezmonan’s time on Earth is coming to an end. That’s awesome, Worf. The shadowing is great. I tried my hands at “scenery” I do believe I may have failed a bit hahaha. Good luck everyone! Great contributions so far! I tried to move away from some of the conventional stereotypes whilst still keeping him recognisable as a demon. The backstory is that the General is leading his troops in the midst of the second angelic civil war. A war that now threatens to spill over into Earth when the use of powerful superweapons begins to accidentally tear open the barriers between planes. Sort of inspired by the Dark Materials trilogy. 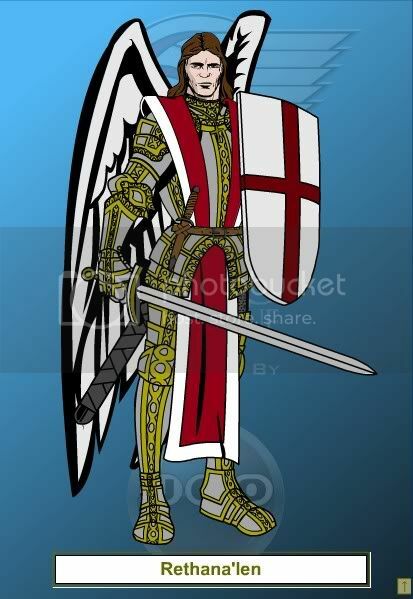 I might make up an equally militaristic angel, or possibly my second concept of a demonic resistance force, pushed back into hell since the first civil war. I decided to make a demon. I love playing with the companions, I can’t help it. Meet DemonOx. If you are not careful he will die on the Oregon Hell. It seems that my last link didn’t work so I decided to re-post it. Torva Lewis was born two Satanist dovouts, who spent their lives in a shack in the forests of California. His name Torva means “savage” in latin. As a young boy, he was very intelligent, and his love of puzzles was adored by his parents. Having no formal education, his parents allowed him to go to the library every day to expand his knowledge, and he learned of several abstract and complex subjects, being able to read and comprehend Dante Allighieri’s “The Divine Comedy” at the age of 9. At 12, his parents had a “revelation” and were convinced the anti-christ had arisen, and to join Satan’s forces, would kill themselves to join their lord and master in hell. They wished for Torva to join them, but the young boy ran, as his parents took the cyanide laced wine. The boy then went insane, developing a dissillusionment of the world and strong sociopathic tendencies, his savagery never being tempered as a child. Torva ended up living on the streets of San Francisco, working as a hitman to survive. He read the works of several philosophers over the practical concept of anarchy, and thought the concept fit well with his still strong allegiance to Satan, despite his parent’s death. He then decided to become active with his Anarchist and anti-religion stance, burning down several churches in the bay area, spraypainting anarchy symbols and pentagrams in the walls nearby. His violence drew national attention, as he continued his campaign of destruction. He then drew the attention of Satan Himself, who rose frm hell to grant him his “curse” imbuing him with Satanic powers of reflexes, strength, and agility, in exchange for his eternal, binding loyalty. 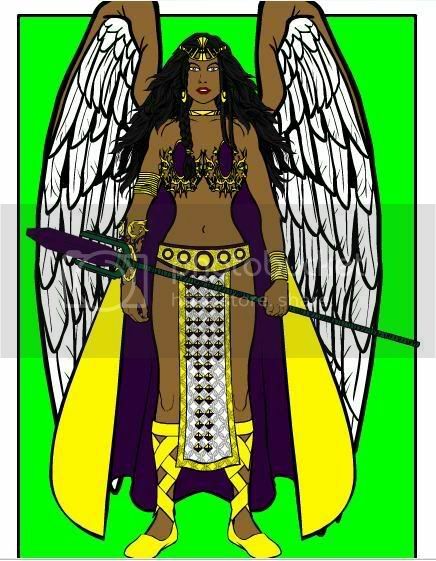 Here is my angel, Isilrun, or more precisely fallen angel. Isilrun has always had a problem with authority as well as a chip on his shoulder. Combine this with some not so high moral standards and picking up bad habits from mortals and it’s easy to see why he got booted out of heaven. 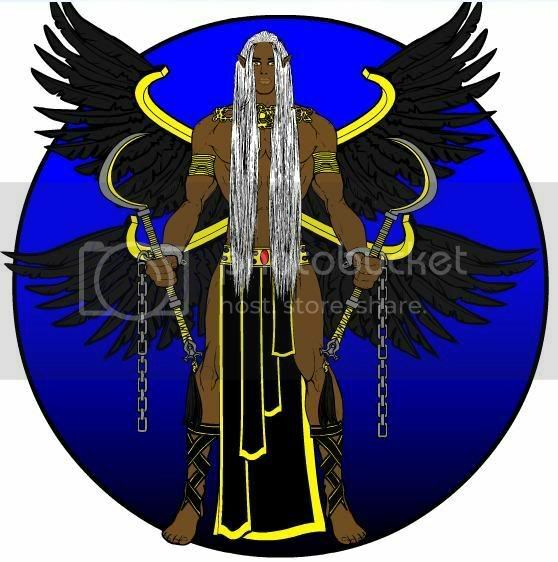 Isilrun now spends most of his time on earth and occasionally ventures to the heavenly gates to receive assignments from Gabriel. He could be accepted back eventually but he isn’t changing his habits. As a mark of falling out of favor his wings have turned black. 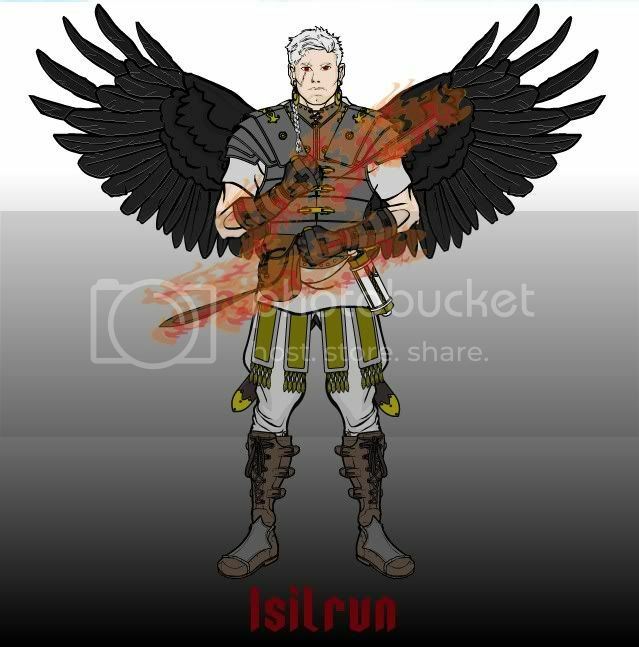 Even though he is one of the youngest angels, Isilrun is easily one of the deadliest. After his fall from grace, he obtained two powerful blades and developed a unique fighting style. He is feared by demons as one of heaven’s top demon slayers and even by other angels who wonder what happened to turn his eyes red and give him a scar that even angels can’t heal. From an original brief from “The Great Bird of the Galaxy” I give you the first version of this “demon” from space. I tried a more traditional view of a demon this time. I was surprised I hadn’t seen this head used yet. 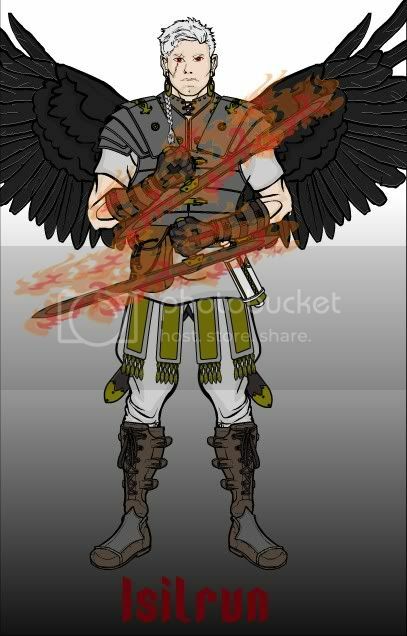 Alezoon was once a pure Angel of God, but one day before the worlds creation, he was betrayed by his fellow allies during the first great war against Lucifer, and was taken to the Ninth Circle of Hell and tortured untill life on Earth began. When life began he gave in to his torture and became a Deamon and was given a Deamon Seal on his cheast to keep in the Devils control. 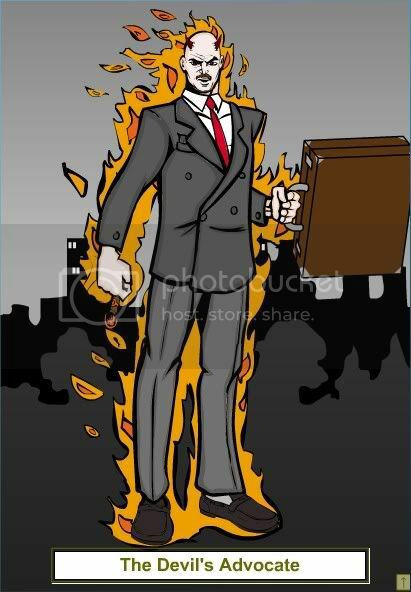 After years of watching life from his pit, he grew tired of watching souls of the dead wondering with anger across the world, so once deciding to go to the Earth above, he attached one million dark souls to the end of a farming Reaper and decided to make sure the souls had been worthy of going to Heaven or Hell with the power to decide their fate with the Weapon he fashoined, and he raised an organisation called the Reapers to help him in his quest and they still help him today. Alezoon lost his name for his job, for he wasn’t just a Reaper, he was the first. Also I see your point Whit, that would be a really good help for somthing like this. Mirakta is one of the most feared demons. When evil warriors become demons, sometimes they retain a human form that allows them to use skills acquired from their mortal lives. 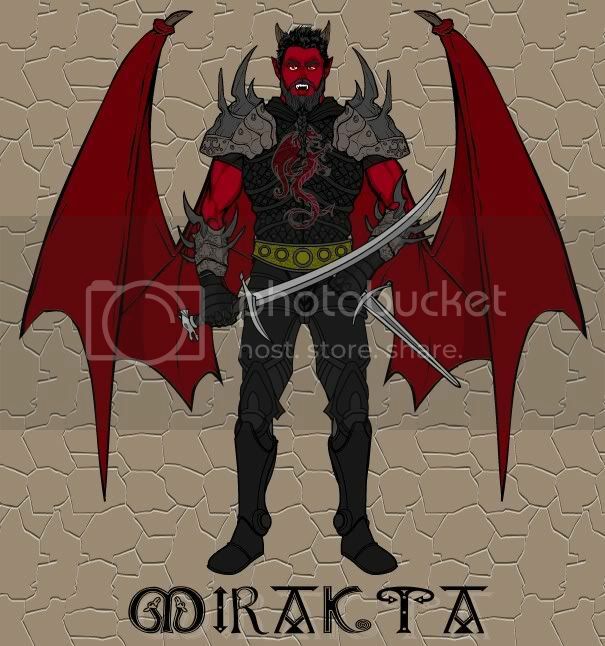 Mirakta used to be a prince with a habit of challenging the innocent and honorable to duels. He now challenges angels to duels. Rethana’len is one of heaven’s Elite Guard and was the teacher to Isilrun. Nevertheless he is disappointed in his favorite pupil. Just for fun an old character I created. Just experimenting some more. This is a fun theme. Also, my little brother commented that my Necragon Deamon looks slightly like the Tyrant from the Resident Evil series, and I would just like to say that it wasn’t suppose to look like it, any resemblances is purely coincidental and I have never actually played Resident Evil ever. Her story and Nightmare Demon can be found in my post in the archives. Many people envision a human with wings when they think of an angel. When the reality is as constructs of the creator they are more a collection of symbols and probabilities. 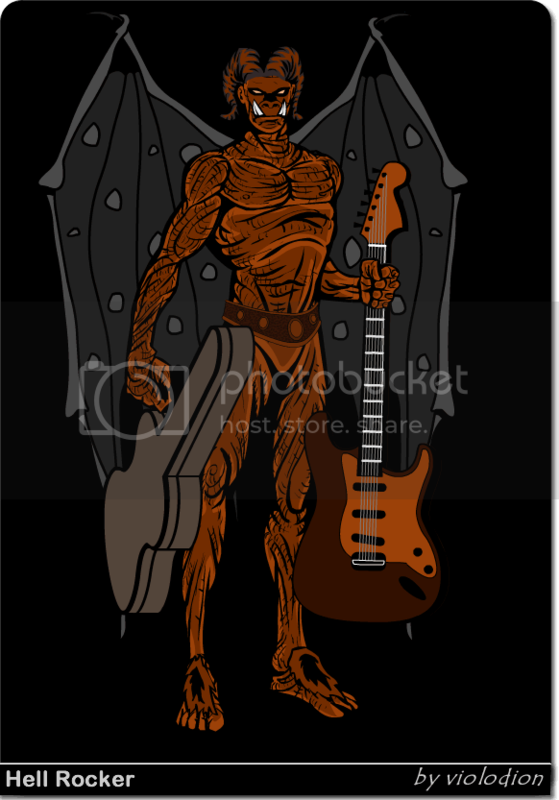 Some may see a winged figure, others may see something else. This is one such interpretation. 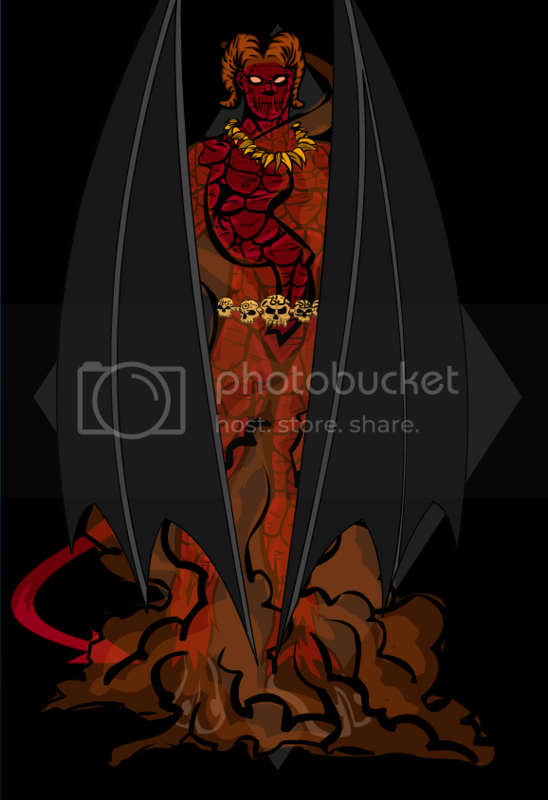 Dark, grim and brooding, this portrait of the enigmatic ruler of the underworld hangs in the halls of Tartarus. 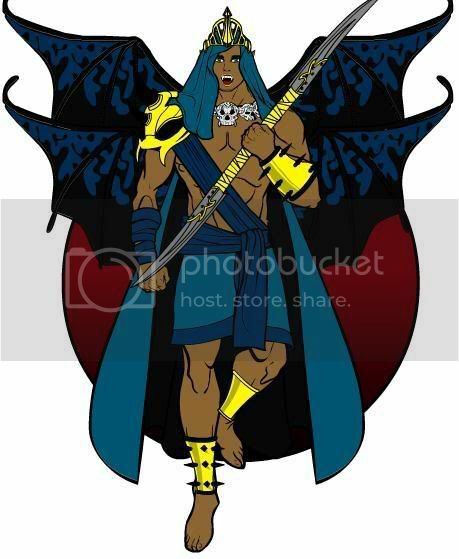 He is one in a long line, a succession of demon kings, all bearing the name of the ancient god of the Underworld. He is depicted here with his symbol, the pomegranate tree. In his hand is a glass of pomegranate wine, his refreshment of choice. He is 23rd in succession, although the number is never used with his title. On another note, the wine glass was the hardest thing to get right. The Inhuman: the gods doesn’t create angels or demons, you do! Through your actions you shape your destiny and, in the end, eventually your outcome. Whether it be an avatar of good or a harbinger of evil. 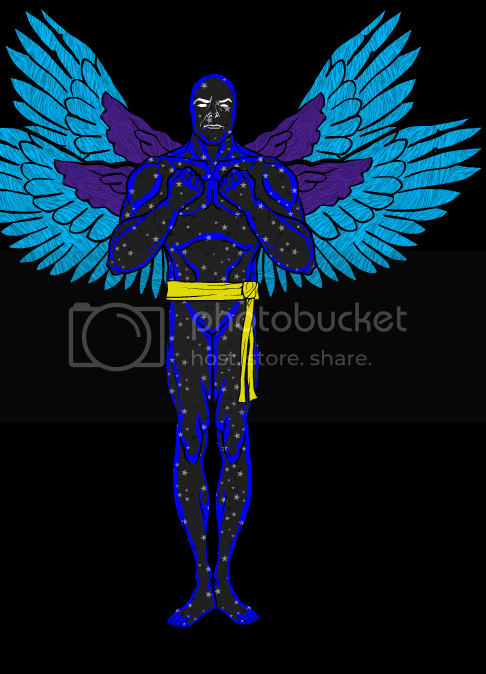 My entry is my version of the classic idea of an angel/demon fusion: a little creation who I like to call “The Chaos Spirit.” The body didn’t turn out as well as I had hoped, but here he is anyway. 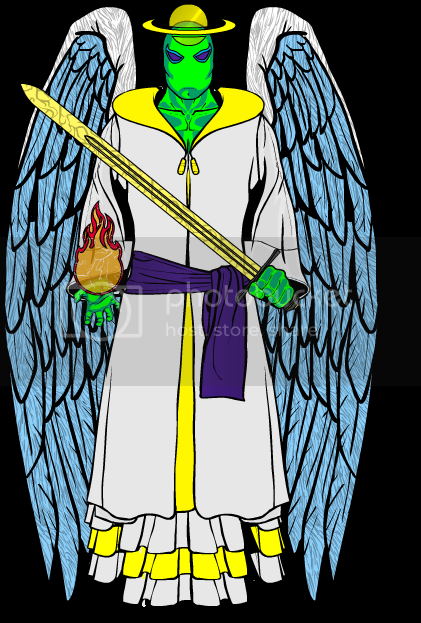 Side note that could get me disqualified: When I saved the picture from HM3, a part of the left wing in the set of demon wings(the one that I covered with a white square) was poking out behind the angel wing, so I had to white it out in MS Paint. I know the rules say no Photoshopping(or Painting in this case), but I think that it was just a small enough little thing to not count against me.